Quick Thoughts: Dinocalypse Now is the literary equivalent of a decadent dessert. It is pulp fiction at its finest, a fun story full of wonderful characters told in a way that makes every moment of the novel count. If you don’t have fun listening to this novel, than you, Sir or Madame, have no soul. I was going to start this review by saying that I used to watch the Superfriends all the time when I was a kid, but that’s not precisely true, I still watch the Superfriends. Well, I watch it with my nephews and with the special needs kids I work with… since I bought the DVDs for my nephews and the special needs kids I work with. I still love the show, whether it’s Wendy, Marvin and Wonderdog or Zan, Jayna and space monkey Gleek. I loved Mr. Myxaptl and Bizzaro Superman and that flying Darth Vader head, and the fact that the Superfriends kept robotic copies of themselves just in case they had to fake their own deaths. Almost all of my superhero knowledge came from that show. I almost never read comics, the medium just doesn’t work for me and so I never really experienced the dark side of superheroes. They were always these all powerful uber-men who were stoic and morally true and dispensed out morality tales to kids and laughed at corny puns even childhood me thought were lame. They were about as close to perfection as you could get, like Jesus with X-Ray vision. They were never really human to me. Their morality tales held little sway, because these were perfect examples of the greatest of humanity so they knew not to vandalize their teachers room or they may end up falling down a broken elevator that someone unwisely left open with nothing but a small sign to prevent such a thing from happening. So, recently, I have been on a bit of a Superhero kick, trying to explore different, darker angles of these mighty heroes, from authors like Larry Correia, Adam Christopher, Peter Clines and many more. 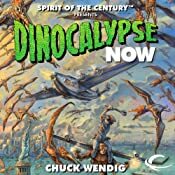 Now, I would like to say this is why I decided to listen to this latest audiobook release by Chuck Wendig, and sure, it had some bearing, but people, the book is called Dinocalypse Now. It has psychic dinosaurs, Conquering Sentient Apes, a potential world ending invasion and is narrated by Oliver Wyman. PLUS, superheroes… How could I NOT listen to this one? When the Centurions, a group of "potent heroes of action" discover an assassination plot against FDR, what they weren’t expecting was an invasion by mind controlling psychosaurs, because let’s face it, no one ever expects an invasion by mind controlling psychosaurs. Yet, this is just the first wave of an attack, being orchestrated by Gorilla Khan, the conquering Ape, father of the Centurion advisor Professor Khan, and aimed directly at the Centurions. Now, those who manage to escape the trap, Jet Black, Sally Slick, Mack Silver "The Silver Fox" and others, must band together with Professor Khan to save the earth from Gorilla Khan, and a powerful enemy working behind the scenes. This book is set in the 1920’s Alternate history world of the Spirit of the Century RPG but no prior knowledge of the world is needed. In fact, one of my favorite aspects of the novel is the constant reference to other adventures, each one seeming crazier and even more over the top than the last. Now, I know more and more we are recommended to eat well balanced meals full of proteins and whole grains and the like, but every once in a while we must simply splurge on something decadent. Dinocalypse Now is like chocolate wrapped in bacon wrapped in THE GREATEST THING YOU EVER STUCK IN YOU MOUTH! It’s got everything you want in a great pulp fiction novel, like Jet Packs, Pterodactyls, Atlantis, Cavemen, soppy romance, women with tools and dirigibles, plus a plethora of things you didn’t even know you wanted. Wendig, who wrote some recent favorites of mine like Double Dead and the Miriam Black series, continues to impress me. He is simply a storyteller. It amazes me how much he can get across with such an economy of words. The action just leaps of the page, because there are no superfluous words holding it down. He deftly captures the rhythms of the speech of that time combining the sharpness of the 1920’s setting with ostentationsness of heroes. I really liked how these heroes seem just like you or me, just a bit enhanced, with the heroic ability to fling themselves into danger with abandon. There are no Supermen or Green Lanterns with extraordinary powers, just people who are a little faster, a little stronger but are mostly heroes because they choose to be. There are even little moral lessons, particularly in the development of Professor Khan, who steals the show, and Mack Silver, but it’s not beat you over the head moralistic life lessons, but true character development that serves the story. And really, this is the key impressive fact of Dinocalypse Now, every crazy moment, every wonderful character and well crafted phrase serves the ultimate goal of this story, to give the reader one hell of a good time. And I had one hell of a good time listening to this tale. Dinocalypse Now is the literary equivalent of a decadent dessert. It is pulp fiction at its finest, a fun story full of wonderful characters told in a way that makes every moment of the novel count. 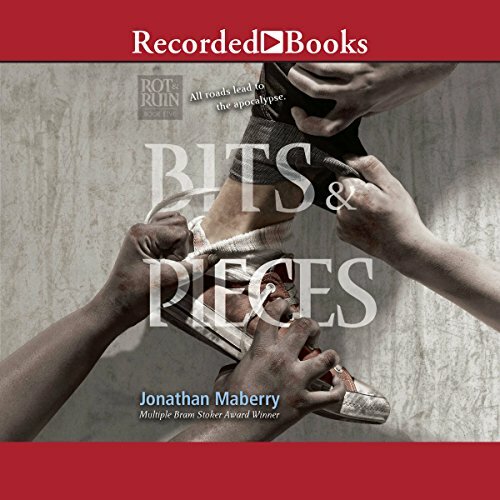 If you don’t have fun listening to this novel, than you, Sir or Madame, have no soul… or perhaps just different taste in entertainment than me. It’s no secret that Oliver Wyman is one of my favorite narrators, and I simply must give a shout out to the sick minds who cast these audiobooks for Audible, because he was really the perfect choice for Dinocalypse Now. I mean, we know the man can do voices. I would venture to guess that the number of voices bouncing around in his skull would make Sybil shake her head in wonder. I find it important to find one quality of Wyman’s narration to point out in each review, instead of simply a laundry list of awesomeness. With Dinocalypse Now, Wyman is a human Cliffhanger machine. He manages to channel his inner "Meanwhile at The Hall of Justice" voice and end each chapter in a way that made you think that the world would come to a gruesome end if you didn’t continue on to the next chapter THIS. VERY. MINUTE.. This was simply perfect in creating a comic book feel for this novel. Wendig’s writing style is perfectly suited for audio, precise matter-of-pact pacing that allowed the listener to follow the action and Wyman just enhances this effect with his solid narration. This is a team that should be paired up more often, despite the potential for inter-dimensional chaos when they are. Luckily for us, this is the first of a trilogy, so there will be more Wendig and Wyman. I know I will be listening. See I love Chuck Wendig – but I don’t know if I’ll be trying this one. What is you final word….just dooo eeeeeet? I’d say go for it, if you like this sort of thing. It’s a quick fast read and tons of fun. I actually read half the book in print before I saw it was coming out it audio.